Garlic Twist Mincer Only $2.50 SHIPPED! You are here: Home / Great Deals / Amazon Deals / Garlic Twist Mincer Only $2.50 SHIPPED! Want an easy way to chop and mince garlic? I have just the thing for you! 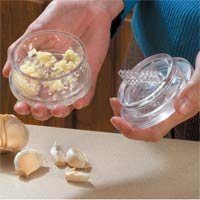 Get this Garlic Twist Mincer for just $2.50 with FREE shipping! I always hate mincing garlic. I never get it small enough. So, I’m totally going to grab this. It’s definitely worth a try – and it will keep my hands from smelling so much like garlic! And, I love that it’s so easy to use!